"Ensuring our future through preserving our past." Our products are designed to provide the tools to the best Chiropractor you can be. The Green Books on CD-ROM contains all 41 Green Books as well as 3 additional bonus texts. Over 27,000 pages in all, complete with original illustrations, this project is the culmination of nearly 6,000 hours of effort to bring you these timeless texts. 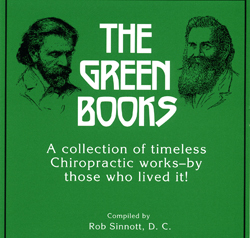 The Green Books are far more than historical reference, as they contain words of wisdom that will help you become not only a better Chiropractor, but a better educator for those seeking your care. The CD-ROM is fully searchable using any word or phrase. Instantly the related writings to your search are made available for your to read, without countless hours of searching page by page through text after text. Any of the Green Books can also be read page-by-page is you choose. It is an impossible task to acquire all of these texts today for under $10,000. One is so rare a copy has only been seen for sale on three occasions in the last 20 years—only three of our schools even have it in their archives! Even the 'reprinted' editions of the few available texts are $30- or more per book. Even if they were all reprinted it would cost in excess of $1300- to buy second generation copies. The Green Books on CD-ROM is compatible with Windows 3.1 through XP, universally. Most versions of Vista are also compatible, although dual processor computers are not at this time. You have heard of these famous cornerstone texts—now you can benefit from having them yourself! Green Books on CD-ROM—only $200-! For generations the safety pin has been an effective model for the communication between the brain and body. This 24 inch hand bent steel is made from cold rolled steel was first made ten years ago and was an immediate hit with DCs in the trenches. The clasp is fully functional and demonstrates the vertebral subluxation and the restoration of communication through the Chiropractic adjustment. It comes with complete instructions for you or a staff member to give an effective explanation to patents either one on one or during lay lectures. Put one in each adjusting room to provide a handy explanation of the role of Chiropractic. They are covered in a durable powdercoat aluminum color. This finish makes them extremely durable. The baked on powdercoat finish does not rub off from repeated handling. This tool will last for your entire career. Since these pins are hand bent only a small number are available. They are made once each year in small numbers and when they are gone they will not be available until a new batch is created. If you are ordering a pin, please email us first to make certain they are available before you order. The Educator makes your job easier as it provides a simple, fast and effective tool for patients to see the bigger picture of Chiropractic. The simplicity of this model provides patients a universally understandable method to explain Chiropractic to their family and friends. Born in Russia in 1950, Masha and Dasha were studied extensively by Russian scientists. Their story explains how the immune function is controlled through the nerve system as are all tissues of the body. This easy to understand poster can serve as a tool for patient lectures as well as being able to passively educate patients as it hangs in your office. It also explains the importance of being checked for vertebral subluxation as a component to health. The poster is a convenient18 x 24 inches and can be framed or laminated to display in your office. Let them read gossip magazines at the dentist's office. When they are on your turf it is your responsibility to offer them information they need to make decisions about their family's HEALTH! This is a simple and straight forward method to educate them towards better health. Masha & Dasha Poster—only $9-! NOW AVAILABLE!! 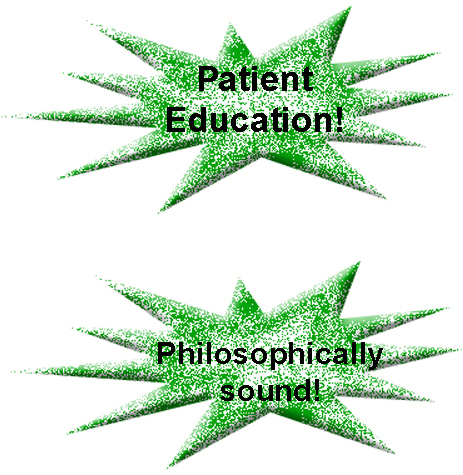 A brand new text that thoroughly explains Chiropractic philosophy!! There is a distinct difference between the way a medical doctor and a Chiropractor view the processes of health. That difference of perception is hinged upon one thing—Chiropractic Philosophy. For the larger part of Chiropractic’s existence there have been only a small number of texts devoted to what defines the role Chiropractors serve in health care. Many students and Chiropractors have expressed the difficulty in grasping the subject of the philosophy of Chiropractic. 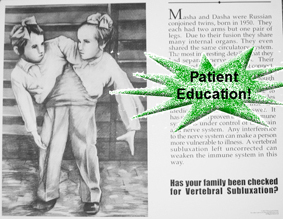 Far too often myths and misconceptions overcome the reality of the profession’s unique views of health and its handicap through vertebral subluxation. This text represents a monumental effort in bringing the core concepts of Chiropractic to a pinpoint focus while making them easily understandable. Dr. 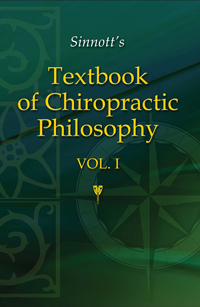 Rob Sinnott’s Textbook of Chiropractic Philosophy is the handbook for those who wish to gain a greater understanding of the rationale of Chiropractic care. It fulfills the need for a contemporary textbook in the education of Chiropractic students and practitioners. 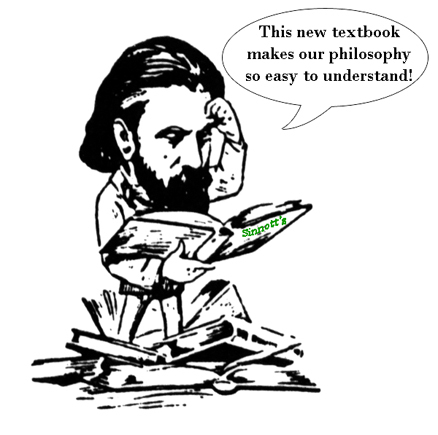 With 291 pages of easy to understand explanations of our philosophy, "Sinnott's—Textbook" is truly the Rosetta Stone for Chiropractic Philosophy! Need an Experienced Speaker for an Event? The textbook's author, Dr Sinnott, is available to speak at your event! He has nearly 100 exciting presentations on topics including Chiropractic Neurology, Research, Philosophy, Technique, Patient Education and Chiropractic History. 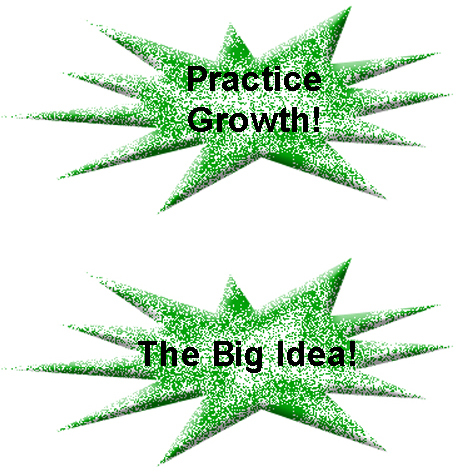 Are you tired of dull presentations with antiquated information? If your group is interested in an interesting and entertaining "pure" Chiropractic presentation coupled cutting edge science click the link below for details! Links for those who truly walk the talk!